So you’ve noticed that your favourite footballer or cricketer has donned a trendy, colourful tattoo on his arm, or your favourite actor has one on the small of her back, and they look just stunning! Body art is in vogue (again), and you just can’t to have one (or more) yourself? But behind those colourful artistic designs and displays impregnated into the skin lie some dark secrets. Let me unravel them and ask the same questions again, if I may. Let me start by looking back into the history of tattoos. Tattooing into the skin is hardly a new phenomenon. My earliest recollection of a tattoo is seeing one with the Hindi equivalent of ‘my father is a thief’ engraved on the legendary Indian cinema’s superstar’s Amitabh Bacchan’s forearm in the movie ‘Deewar’. I had since thought that tattoos are a form of punishment! Well, I still think that it is in a way. Why would one otherwise pay a small fortune to have thousands of needle pricks in their skin? Is what they get in return, worth the pain? With time I learnt that history of tattoos predates the release of ‘Deewar’ by a few thousand years. According to Wikipedia tattooing has been a Eurasian practice at least since Neolithic times. Ötzi the Iceman, dating from the fourth to fifth millennium BC, and many Egyptian mummies bearing tattoos and dating from the end of the second millennium BC have been discovered. Tattoos formed their identities and still do for several indigenous tribes. They also formed identities of prisoners of wars, sociopaths, and cattle and livestock in which they still do. 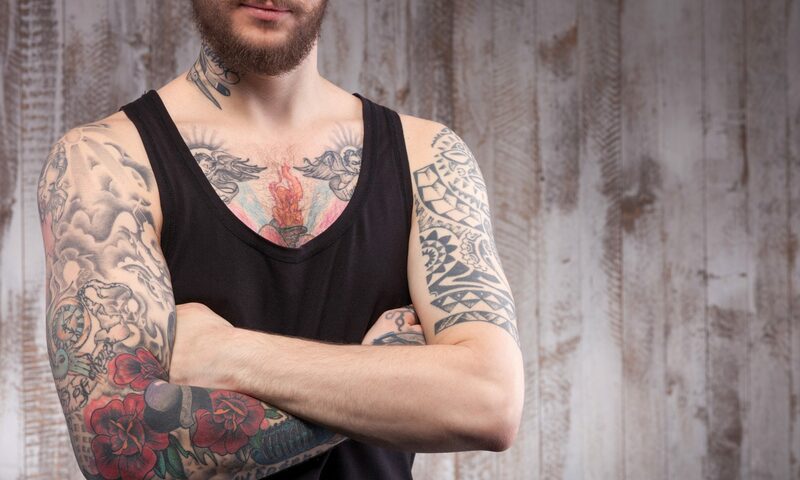 Tattoos are not just ‘decorative’ or ‘professional’ which some argue are an art form. Other types of tattoos include ‘amateur’ tattoos, ‘cosmetic’ tattoos, ‘traumatic’ tattoos and ‘medicinal’ tattoos. Amateur tattoos are simple, usually blue- black in colour, performed by an amateur on themselves or on whom they can lay their hands (usually after a night out under the influence of ‘spirits’). They can fade with time but if not, can be removed with relative ease. Some women prefer to have permanent makeup to define their eye or lip lines. Some balding men would prefer having black ink tattooed into the scalp to hide the baldness. These are called cosmetic tattoos and are quite commonly performed by tattoo and beauty therapists. Penetrating injury to the skin may lead to deposition of substances such as asphalt or graphite resulting in traumatic tattoos. When tattoos are deliberately made for medical reasons such as before cancer radiotherapy these are called radiotherapy tattoos. The most complex of all however are professional tattoos. This is so because of a range of different colours which are used. So far so good, but why am I recommending caution before having professional tattoos. For several reasons, I’d say. As these tattoo inks are delivered into the skin using needles there is potential for infections. As a doctor, when I see someone with many tattoos and liver problems I would think of Hepatitis C infection. This is a very contagious (infectious) viral infection which is easily transmitted via contaminated needles. Other infections such as Hepatitis B or HIV (which causes AIDS) are also possible if the tattooist (tattoo artist) is not careful with disinfecting their equipment and using non sterilised needles. Sometimes we see quite weird infections such as TB of the skin at sites of tattoos. The tattooist must wash their hands and must also wash and clean the area to be tattooed. Gloves must be worn at all times and the wound must be wiped frequently with a wet disposable towel of some kind. The equipment must be sterilized in a certified autoclave before and after every use. It is a prerequisite that every tattooist uses disposable or single use needles. If you have any doubts about the hygiene in the tattoo parlour, make sure you find the quickest way out. You wouldn’t go to a shabby clinic to receive unclean injections, would you? A wide variety of inks are used in colourful and elegant looking decorative professional tattoos. Some of these can cause problems. If one considers removal of their tattoo at a later date, some inks are more difficult to remove than others. Certain inks more specifically red ones can cause skin reactions and allergies. These can not only distort the shape of the original tattoo but can also be very itchy and difficult to treat. Another thing to remember when having black tattoos containing iron pigments is that if one has to undergo an MRI scan, these inks can pose problems in interpretation of results and may even cause burns! Injury or trauma to skin results in scarring, and this scarring is quite variable and differs from person to person. Whilst most people will get perfectly fine tattoos, some people may scar quite badly and this may be irreversible. So if you have a tendency to bad scarring such as that after surgical procedures, think carefully before having a tattoo. Some times people come to me seeking tattoo removal for psychological reasons. Having an ex partner’s name tattooed on sensitive areas can be quite distressing if one wants to move on in life. Some life events can be quite traumatic and if one had a tattoo nearer the time, looking at the tattoo can bring back bad memories. So what can be done if one wants to get rid of their tattoo for whatever reason? In the days when lasers were unavailable, procedures such as rubbing salt or similar into the tattoo, cutting out the tattoo or surgical scraping were the only available options. All these resulted in variable and unpredictable levels of scarring. Since we have excellent lasers that can improve tattoos of varying colours, such treatments are rarely used now. The advantage with lasers is the very low risk of scarring. However, lasers are not magic and may not be suitable for certain tattoo colours such as yellow. Additionally, complete clearance of multicoloured tattoos is unlikely and currently available lasers work better of amateur and blue/black tattoos. If performed incorrectly, they can also be associated with certain side effects such as burning of skin and scarring. Of course, the treatments can be quite painful and expensive. If all this has put you off having a tattoo on your next birthday, why not try a temporary tattoo made from vegetable dyes? This way you can have the pleasure of having your desired body art, without having to endure the pain of having to remove it should you so wish. Or if you’re like me, just appreciate the beauty and art of the perfect tattoo on someone else’s skin!